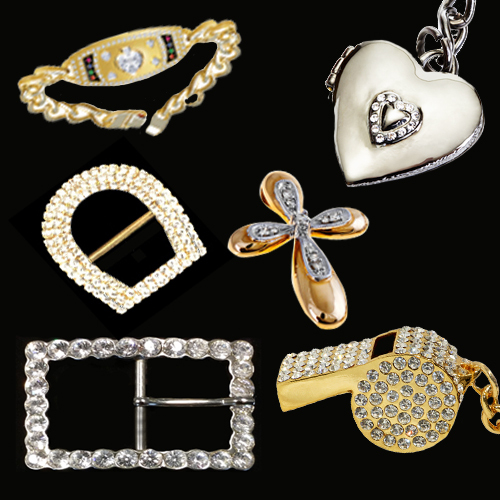 Devanét® is able to create designs and produce buckles, metal jewellery, pendants, belts, cufflinks and bespoke elements embodied with crystals. Working predominantly in solid brass to facilitate the quality of finish required and using dazzling crystals by Swarovski®, Devanét® is able to offer customers bespoke solutions in a variety of sizes and colours. The crystal buckle or crystal jewellery piece will first be created in modelling software, simulated and then toolpaths set for each layer to achieve a precision milled item. The next stage is to tumble, polish and plate the buckle or jewellery piece in silver or 24 carat gold plate and then insert the crystals. It is important to mention that the whole process is more involved than traditional buckle manufacture as each crystal is inserted manually. Various grades of crystals are used to suit each piece. All buckles, gifts and jewellery pieces made by Devanet® are adorned with crystals from Swarovski®, and we provide each customer with a certificate of authenticity to state that every Devanet® crystal product is embellished with crystals from Swarovski®.